Every great organization starts with a great story, and ESSA is no exception. Born in the 1970s at the crux of the environmental movement and the renaissance of environmental management science, where we came from influences the work we do today. ESSA was hired to facilitate Federal, Provincial, and Territorial government partners to provide contributions to the Pan-Canadian Framework on Adaptation and Climate Resilience in 2016. Read more about this process in the Adaptation Working Group report found here. A book on Adaptive Management published in 2015 contained a chapter on the current practice of AM authored by three of ESSA’s Senior Partners. Citation: Murray, C.L., D. Marmorek and L. Greig. (2015) Adaptive Management Today: A Practitioners’ Perspective. Chapter 10, in: Adaptive Management of Social-Ecological Systems. Allen, C., A. Garmestani and C. Smith (Eds.). Springer. ESSA began to use the cloud as a computing platform, using cloud based servers and particle swarm optimization to implement "turn taking optimization" for more flexible water management in the Sacramento River. On September 19, 2011, David Marmorek testified before the Commission of Inquiry into the Decline of Fraser River Sockeye about cumulative effects that may have impacted sockeye returns during the fisheries collapse of 2009, summarizing the conclusions of ESSA's Cumulative Effects study for this inquiry. FWMT wins Premiers Innovation Award - 2008 ESSA developed the Fish Water Management Tools (FWMT), a decision support tool that helps water managers decide how to release water from Okanagan Lake in a manner that benefits sockeye, while still meeting many other socio-economic and ecological objectives in Okanagan Lake and the Okanagan River. The tool is used on a weekly basis during critical times of the year, and in 2008 won the Premiers Innovation Award. In 2004 we were chosen by the Washington-based NCSSF (National Commission on Science for Sustainable Forestry) to study the factors that enable successful adaptive forest management (AM) and how these factors might vary across organizations and at different scales. We gleaned insights from each of 20 leaders representing the private, public and NGO sectors; distributed across nine states and two provinces and with projects that ranged from plot to watershed scales and with budgets up to seven million dollars. Work on the Okanagan Fish/Water Management Tools begins (FWMT). Against all odds, Okanagan sockeye continue to persist, with adults swimming 1000 km upstream past nine major dams on the Columbia River to spawn in the Okanagan River, and their progeny reversing the trip. ESSA has worked closely with various groups to build tools and conduct analyses that support actions to conserve this amazing stock of salmon. The tool is used on a weekly basis during critical times of the year and has been recognized for it's contributions to conservation science with a 2008 Premiers Innovation Award and a 2012 Murray A. Newman Award for Significant Achievement in Aquatic conservation. ESSA staff become facilitators for the Collaborative Systemwide Monitoring and Evalutation Project (CSMEP) in the U.S. Columbia Basin. ESSA's work in the Columbia Basin continued with a multi-watersheds project for evaluating the benefit of fish restoration projects in the U.S. Columbia Basin, and is ongoing through work on the Columbia River Treaty. CALFED Clear Creek projects begins. In 2008, CALFED funded a project to initiate moderate geomorphic flows, and pay the cost of foregone power production. ESSA broke the 1000 project mark in 1998 with "An Integrated Carbon Budget of Weyerhaeuser's Woodlands and Manufacturing Operations: Development of an Analytical Framework". The Tool for Exploratory Landscape Scenario Analyses (TELSA) is a spatially explicit, GIS-based landscape-level model for simulating terrestrial ecosystem dynamics. It helps resource managers and planners assess the consequences of alternative management scenarios at the landscape scale. TELSA can be used as a tool for landscape modelling, for adaptive management, or for any other planning process that involves different groups of experts and stakeholders who need to compare and assess the outcomes of different assumptions across space and time. The Vegetation Dynamics Development Tool (VDDT) a non-spatial state transition modelling tool, was originally created to assist with the Columbia River Basin Assessment related to protection of the spotted owl. The model required input about states of the landscape, and succession, insect, pathogen, and fire pathways and probabilities for all areas within the basin. In 1995, ESSA and SNC-Lavalin were successful in winning the first phase of what became a 2-phase, 10-year, million project to improve the management and protection of Vietnam’s environment, by strengthening the capacities of key national government and provincial entities to manage industrial and urban pollution, implement environmental impact assessments and conduct environmental monitoring. VCEP continued to 2004, using a "Train the Trainers" approach to train over 2,000 people. According to CIDA’s final evaluation, VCEP is considered to be "CIDA’s best environmental project in Southeast Asia in the past 10 years.". Asian Development Bank project In the mid-1990s we undertook our first large international EIA expert system project, for the Asian Development Bank, with a team that included consultants from TATA in Pune, India. ESSA leads authorship on the very first State of Environment Report for British Columbia. This project involved more than 50 advisors, and necessitated the magic trick of condensing more than two bookshelves full of papers, reports and raw data into a non-technical publication just over 100 pages in length that could be easily understood by the public. This was a landmark document for state of environment reporting in Canada, and led to many subsequent projects in this field, in both North America and Asia. ESSA started working on a model of forest carbon for all of Canada, including trees, soils, and the wood forest products that ultimately end up in buildings, libraries, land fill sites or the atmosphere. Modelling forest carbon became the primary focus of ESSA employee Werner's work over the next 21 years, thirteen of those at ESSA, and the last eight at CFS, including work with the Intergovernmental Panel on Climate Change, which was awarded the Nobel Prize in 2007. So ESSA can now say that we helped a teeny bit to nurture a Nobel Prize winner! For over 20 years, we have enjoyed continuous collaboration with scientists from the US Forest Service, working closely together on a wide variety of scientific and decision support problems. One of these partnerships has focused on the development of the Forest Vegetation Simulator (FVS), a forest stand growth model that is widely used across the US. We have helped develop extensions; models of root disease, dwarf mistletoe, mountain pine beetle and non-timber environmental indicators. The Saval Ranch project involved meeting with cowboys and various BLM / university scientists in Elko, Nevada, building a simulation model to help understand the effects of cattle grazing on plants, water, birds and fish. Like many early models, it got complicated really quickly, and forced the building of a much simpler version. The simple model was well received as they understood what was going on. Our biggest contribution was teaching the value of integrated systems thinking, and the need for strong experimental designs to detect the effects of their alternative grazing treatments. 1981 – Mike Jones, Dave Marmorek, Pete McNamee and Tim Webb all join ESSA as full time employees, while concurrently attempting to complete their graduate work at UBC. UBC was really ESSA’s farm team, with superb mentoring from Buzz Holling, Carl Walters, Randall Peterman, Bill Neill, Judy Myers, Charlie Krebs and many other great profs. 1980 – The first of many ESSA acid rain workshops, this one in Ann Arbor Michigan. Dave Marmorek had just come from hiking in the Trinity Alps in CA, and was dressed in a 3-piece suit and wearing bright blue and yellow Adidas running shoes. We must have made a good impression, because a participant (Larry Barnthouse, of Oak Ridge National Labs) called 13 years later (1993) to offer ESSA an opportunity to work on the impacts of dams in the Columbia Basin, where we have been working ever since. The first project on record (PR001) was called "An Adaptive Environment Assessment Approach to the Effects of Development of the Alberta Oil Sands". The project team consisted of Bob Everitt, Mike Jones, Nick Sonntag, and Mike Staley. ESSA Environmental and Social Systems Analysts is created by Bob Everitt, Nick Sonntag, Mike Staley and Joan Anderson (hence a double acronym). Bob, Nick and Mike were all grad students at UBC who had been exposed to Adaptive Environmental Assessment through their instructors and research. ESSA’s roots extend back into the 1960’s and 1970’s as the offspring of two complementary but sometimes quarrelling environmental management world views: 1) expanding environmental awareness and policies; and 2) the growing application of rigorous systems analysis to ecosystems, including humans. Let’s call them Green and Blue. Some heroes will emerge in this story to calm the quarrelling and find a creative path forward, so please read on. The Green Parent accomplished a huge amount during a short decade. 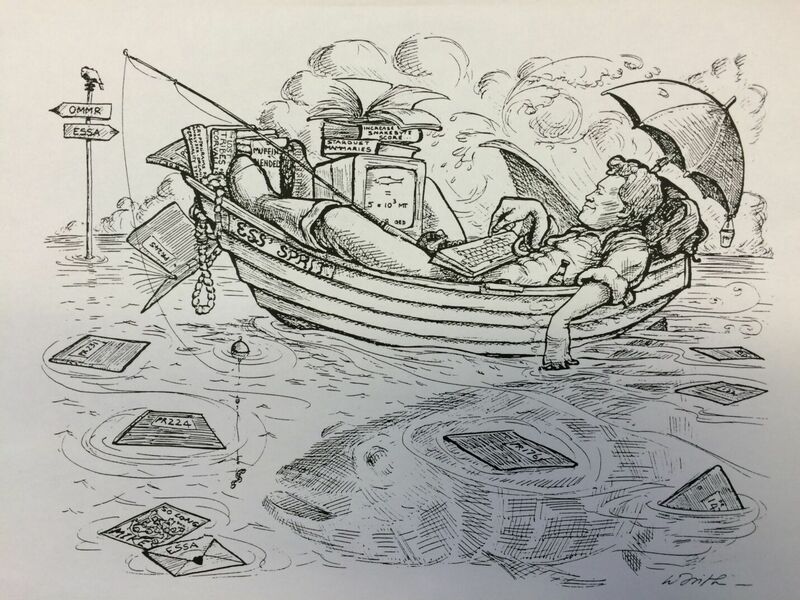 The publication of Silent Spring by Rachel Carson in 1962, and an oil spill in Santa Barbara in 1969, inspired an environmental movement that led to a creative surge of environmental concerns, conversations and policies. We look back now in retrospective amazement that during the period from 1964 to 1970, the U.S. federal government passed the Wilderness Act, National Environmental Policy Act, the Endangered Species Act, a greatly improved Clean Air Act, and the Clean Water Act. These are all landmark pieces of legislation, which improved the way we plan and operate our societies. In 1972 the United Nations held the first global environmental conference in Stockholm, concluding with a declaration of common principles to “inspire and guide the peoples of the world in the preservation and enhancement of the human environment”. Canada listened to the Green Parent, and in 1973 agreed to screen all development projects initiated by the federal government for their potential environmental impacts. Meanwhile, the Blue Parent was busily taking ecological experiments and scientific understanding beyond the field and lab into simulated worlds on the computer. Pioneering Blue Parents included Howard T. Odum (who applied systems theory to ecosystems), Donella and Dennis Meadows (and co-authors), who modelled the world’s economy and environment for the 1972 book Limits to Growth, and C.S. “Buzz” Holling, who in 1973 synthesized an enormous number of studies for his paper on the Resilience and stability of ecological systems. The quarreling between Green and Blue started in the early 1970’s. To comply with environmental regulations, Green produced voluminous environmental assessments (EAs), with long lists of species found in the project area, checklists of which actions might affect which species, and tenuously worded predictions of environmental impact. Blue would shout: “The EA Emperor has no clothes! You have no empirical evidence, rigorous science and systems analysis to support your conclusions regarding environmental impacts; there are enormous uncertainties; and your EAs don’t help decision makers!”. Green would reply: “I’m doing my job the best I can – you’re not much help!”. Environment Canada intervened as a quasi-marriage counsellor from 1974 to 1976, funding a series of focused case studies to stimulate dialogue and synergy between environmental managers and scientists, and determine if systems analysis could improve EA practice. Five-day workshops were held at the University of British Columbia (UBC) and the International Institute for Applied Systems Analysis in Laxenburg, Austria (IIASA), with exploratory simulation models used to integrate system understanding and focus the conversation on critical uncertainties affecting decisions. 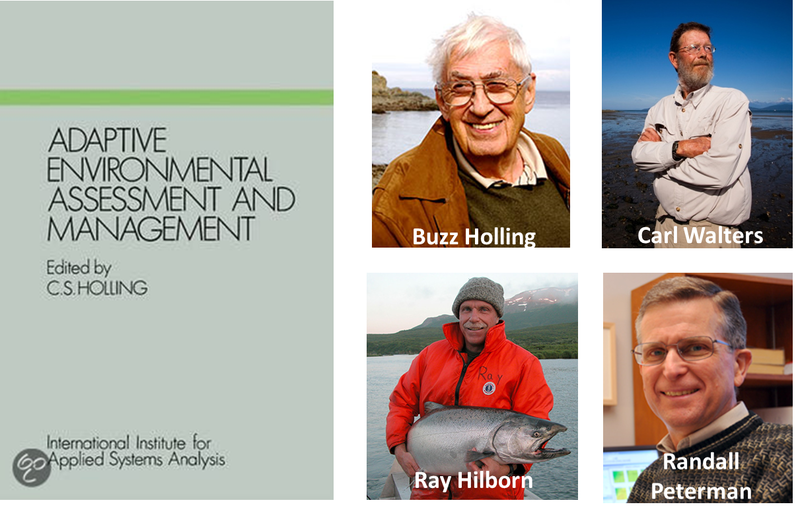 These case studies were merged into a 1978 book called Adaptive Environmental Assessment and Management (AEAM), edited by Buzz Holling, with key contributions from Buzz, Carl Walters, Randall Peterman and Ray Hilborn. The book had an exceptionally boring grey cover, and was known affectionately for decades afterwards as “The Grey Ghost”. But inside was a rich trove of valuable concepts and methods, the birth of the principles and practices of adaptive management, as well as stimulating explorations of human-ecosystem resilience. At its core, AEAM involves embracing uncertainty, applying both rigorous science and systems analysis to understand environmental problems within dynamic ecosystems, and deliberately designing contrasting actions and associated monitoring so as to learn over time. The above UBC scientists had attracted a number of similarly minded and talented graduate students, who soon were trained to run workshops, build models, and lead focused conversations between managers and scientists. Three of these grad students (Bob Everitt, Nick Sonntag, Mike Staley) found an administrator named Joan Anderson, and on November 1, 1979, created ESSA Environmental and Social Systems Analysts, a double ESSA acronym. 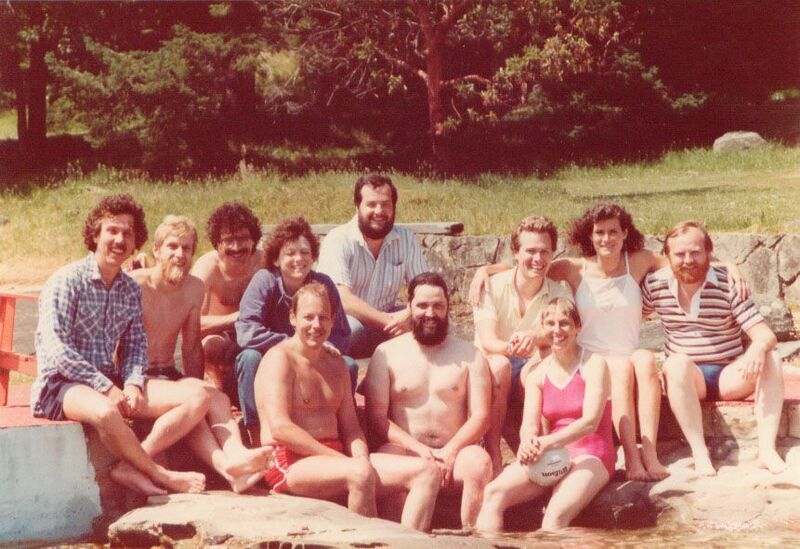 ESSA in 1983 at Yellow Point Lodge: Back row – Bob Everitt, Tim Webb, Dave Marmorek, Gina Cunningham, Mike Staley, Mike Jones, Jean Zdenek, Lorne Greig. Front row – Nick Sonntag, Pete McNamee, Pille Bunnell. Mike Jones leaving ESSA for the Ontario Ministry of Natural Resources in 1988, happily simulating a very large lake herring. ESSA grew in multiple dimensions, adding more people and applying the principles of AEAM to a wider range of problems. These included industrial and urban pollution in Asia, the effects of multiple pests on forest management, the impacts of energy facilities and other factors on fish populations, the design of very large scale monitoring programs, and the role of carbon and climate change in forests. While AEAM remained at the core of our practice, we diversified the tool box we’d use for different challenges, including both expert systems and decision analysis. 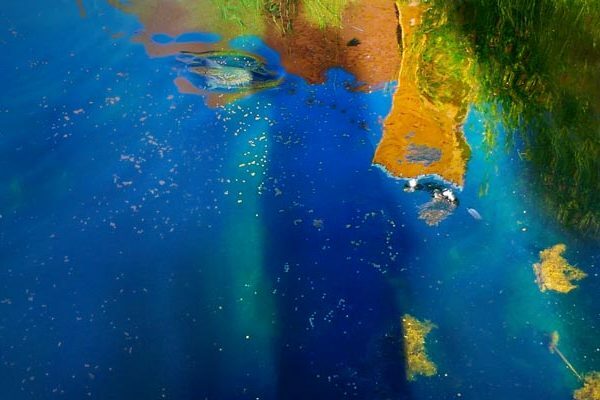 We learned that each environmental problem and set of institutions required a unique set of processes and strategies, and developed more shades of Green and Blue to add to our palette of paints. We were extremely fortunate to work with many talented managers and scientists in government, non-government and private organizations. These clients and colleagues became part of our larger learning community, deepening our insights about ecosystems and people, and allowing us to both learn and make a positive difference in the world. Our growing reputation has created opportunities to apply AEAM principles to environmental assessments, ecosystem restoration and species recovery programs in many parts of North America, and to EAs and climate adaptation plans in Latin America, Asia and Africa. Work in developing countries involves building capacity in both communities and agencies, and carefully selecting tools and assessment procedures that can be sustained over the long term. Some of our most meaningful projects have included work to recover fish and wildlife populations in the Columbia, Okanagan, Trinity, Rio Grande, Platte and Missouri River basins. In some cases we’ve been fortunate to see multiple iterations of the AEAM cycle: assessing problems, designing implementation and monitoring plans, implementing those plans, seeing significant improvements, learning, and adjusting both hypotheses and actions. As we deepen our understanding of problems, we see the need to increasingly merge multiple streams of knowledge to help clients, communities and ecosystems: environmental assessment, adaptive management, ecological science, and climate change adaptation. We remain closely associated with both UBC and Simon Fraser University, serving as adjunct professors to bring our real-world experiences to faculty and graduate students, and working collaboratively with them on many projects. Our commitment to this beautiful Green and Blue planet, and its inhabitants, remains as strong as ever. The latest ESSA family portrait.